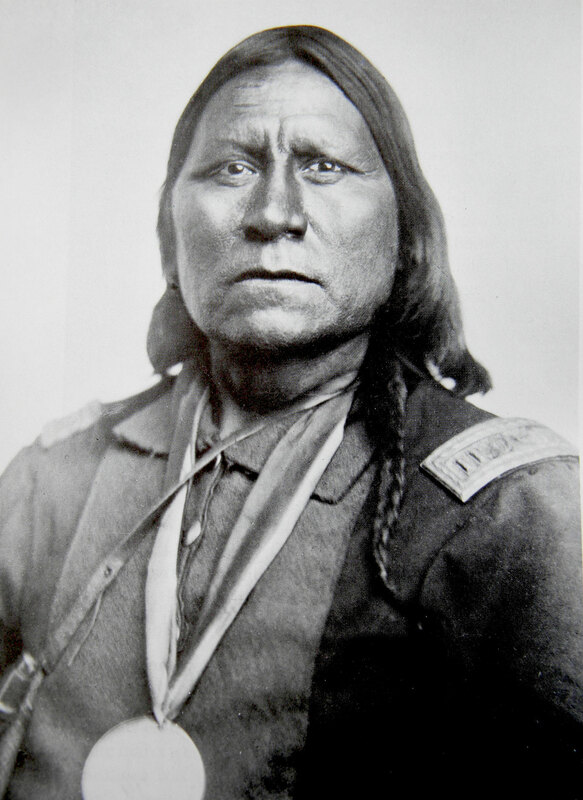 Satanta was born in 1820. He was a Kiowa, and at the time there were only 2,000 of them. They fought along side the Comanches, and together they controlled an enormous region. This area included parts of Oklahoma, Kansas, Texas, Colorado, and New Mexico. Satanta stood over 6 feet tall and he had huge shoulders and a barrel chest. He liked the color red so much that he lived in a red tipi, and painted his face and body red when he was on the war path. He even decorated his lances in red streamers. Around the campfires, all that the Kiowa talked about was the white settler invasion. The discovery of gold in California, in 1848 had brought a steady invasion of settlers who wanted to cross Kiowa territory by way of the Santa Fe Trail. This invasion reach it peak in 1859, when over 90,000 emigrants crossed the trail. Most of these people traveled in covered wagons, and almost all of them had cattle. Before long, the Satanta and the Kiowa began attacking the settlers. They attacked ranchers, stage coach stops, and wagon trains. In April of 1867, General Winfield Scott Hancock asked the Kiowa chiefs to come to Fort Dodge, Kansas to negotiate a peace treaty. Before the meeting, Satanta told the other chiefs, “The good Indian, he that listens to the white man, gets nothing.” Satanta spoke eloquently at the peace meeting. He told General Hancock that he didn't want to see the prairie stained with blood. The general took this as a sign of encouragement. He was so impressed that he gave Satanta the hat, coat, and slash of a U.S Army major-general. Hancock was shocked when only a few weeks later, Satanta dressed in his new clothes, led a raid for horses against Fort Dodge. Then in October 1857, at Medicine Lodge Creek in southern Kansas, over 5,000 Kiowas, Comanches, Southern Cheyenne, and Southern Arapahos met with peace commissioners. General William Tecumseh Sherman told them that they had no other choice but to give up there old ways and follow the white man. He told them that no matter what they couldn't stop progress. He said, “You must submit, and do the best you can.” The Indians all agreed to settle on a reservation in the Indian Territory (Oklahoma). They weren't on the reservation very long before the mood turned to anger. The food was mostly salt pork and corn meal. They asked for guns and bullets so that they could hunt, but they were never given any. Then, when there was little food some of the Kiowa went looking for buffalo, but there were none. Buffalo were being slaughtered by the millions. Each hide was worth 3 dollars, which at the time was the average pay for a week. White hunters eagerly stripped the animal hide off and left the carcass to rot in the sun. Out of desperation, in May 1871, Satanta attacked a wagon train near Fort Richardson. They looted the wagons, and left seven men dead. Satanta, and two other chiefs admitted to what they had done. They said that they had no other choice and they listed their reasons. General Sherman immediately had Satanta, and Chiefs Satank, and Big Tree arrested. They were subsequently all found guilty of murder. Satanta, and Big Tree were paroled in 1873. As soon as they were released they again began to raid. At one point over 3,000 cavalrymen were looking for them. Only this time the soldiers had repeating rifles. Eventually, Satanta and Big Tree turned themselves into the authorities. Realizing that he would never be released. Satanta committed suicide in the Texas State Prison on September 11, 1878.